Two years ago CEZ, the largest energy company in the Czech Republic, launched an internship program for recent female high school graduates. To select the young women, they ran a competition in which bikini-clad applicants posed in a nuclear power plant’s cooling tower – the women with the most votes on Facebook was awarded the internship. Is this exceptional in the Czech Republic? 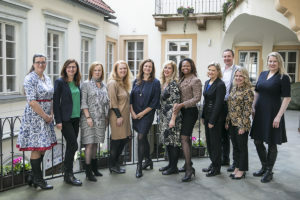 The question and many others associated with the struggle that women in leadership confront were discussed at Women Friendly Employers: Together for Diversity, a conference hosted by NYU Prague. It was initiated by the Women in Leadership platform which hopes to encourage cooperation in promoting effective approaches to gender diversity and women in leadership. 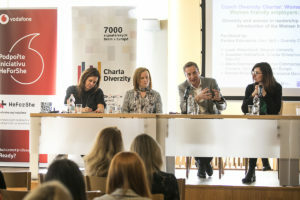 The platform was created by the Czech Diversity Charter in partnership with Vodafone and NYU Prague and it aims to adress the fact that Czech Republic has only 7% of women in leadership and the situation is not progressing. 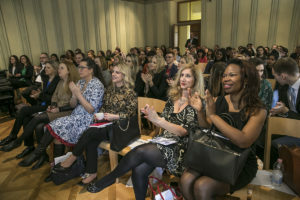 Speakers included Muriel Anton, NYU Professor and the former CEO of Vodafone, Alena Sochorova, a top executive at Microsoft, Dinah Spritzer, a journalist for the Jewish Telegraphic Agency and an NYU Prague professor, and Jonathan Rutherford, Vice President at Vodafone Czech Republic. They spoke about Czech society’s perception of women as the primary caregivers of children, the importance of education to change attitudes, how the government can provide structural changes such as investing in quality daycare, and what top companies can do to lead the way. The sole man on the panel, Jonathan Rutherford, spoke about how the Vodafone company has tried to help employers realize that it’s economically beneficial to have different perspectives in the business world – and that it’s the right thing to do. He emphasized that we do not need to change women, but rather to open the minds of some men, and the only way to do this is if men are included in the discussion. “Getting people involved in the debate can be difficult. Men can be scared – they sometimes see it as a zero sum game, that the status quo is being disrupted in a way that is not in their favor,” noted Rutherford. Pavlina Kalousova, the chair of the Czech Diversity Charter and the conference organizer, says that this is a long-term project which she hopes will lead to more programs promoting gender equality like the ones at Vodafone. She already has two upcoming follow-up events planned: a discussion about equal pay and another about supporting working parents. Approximately 90 people came to the conference, including representatives of large multinational companies, government, media, as well as NYU Prague faculty and students. Also in the audience was Michaela Chaloupková who is on the Board of Directors at CEZ, the aforementioned energy company. She apologized for her company’s sexist internship recruitment program and noted that it was the failure of one employee which led to a disastrous public relations issue. The incident had positive results – the company took measures to work towards more equal environment, such as establishing independent gender audits. Discussions and heightened awareness of the problems that women face will hopefully result in more private and governmental organizations reevaluating their policies, and the Women in Leadership platform aims to help to catalyze this.